The Cid was an important figure in the Spanish Reconquista of the Iberian peninsula in the eleventh century. He was a gallant warrior around whom men rallied and about whom legends sprang up. This famous account of his life was written about a hundred years after his death, and it is generally considered to be one of the early masterpieces of Spanish literature. The poem survives only in damaged manuscripts, so that it is incomplete as it stands. Most notably, there is a significant chunk missing from the beginning, and the ending is also lost. The poem we have opens in media res with the Cid — or, as he is usually called in the poem, my Cid — being exiled from Castile. Turning his lemons to lemonade, he takes the opportunity to make a name for himself in the wide world. The principal arc of the poem’s narrative concerns his roaming forays against Muslim towns, his eventual assault upon and triumph over the great coastal city of Valencia, and his defence of the same against Islamic efforts to dislodge him. Once established, he marries his daughters to some noblemen — who turn out to be strikingly ignoble in their treatment of their wives. The last act of the poem is concerned with the Cid’s revenge upon his scoundrel sons-in-law. He could no longer count the Moors he had killed. we might justifiably wish for a little more peace, love, and understanding. I don’t want to come across as facetious. There is actually quite a lot of nuance in the text, and a considerable amount of tenderness to balance the violence. On one level the entire poem is a kind of domestic drama in which the Cid is only trying to secure good marriages for his daughters — a kind of cross between Beowulf and Pride and Prejudice. It is jarring to modern sensibilities, but arguably that is part of its appeal. The truth is that of the major works of medieval literature that I have read — admittedly more or less limited to Chaucer, Dante, Chretien de Troyes, and Beowulf — El Cid is the one I have enjoyed the least. Its political incorrectness was not part of the problem for me — quite the opposite, if anything (I am sorry to say). The translation may be part of the issue, although I admire Raffel’s translations of Chretien de Troyes. Somehow the poem never really came to life for me. The Cid himself seemed a distant figure, dashing and brave, but thin. I worry that the poem’s fame is due more to its mere survival of the ravages of time than to its intrinsic merits. But one should not be overhasty with such judgments, especially when reading in translation. Incidentally, the word “Cid” is a gloss on the Arabic “sayyid”, meaning, in context, something like “lord”. 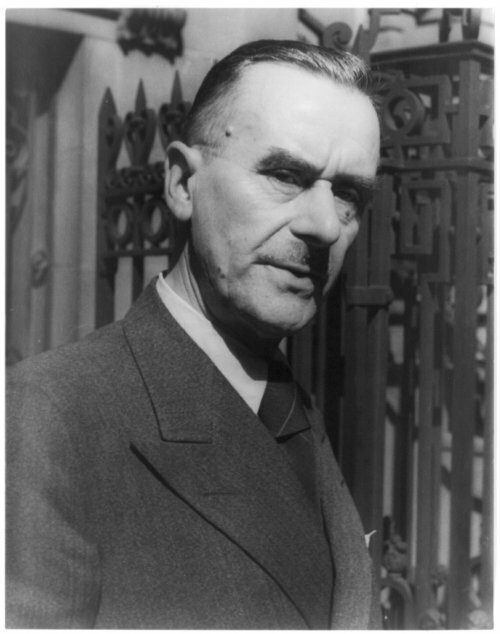 I may not be blogging much here lately, but today I’ve submitted a short piece on Thomas Mann to the 52 Authors series at Light on Dark Water. I’ve been enjoying this series all year, and it’s nice to be able to be part of it. You can find it here.